Clemson Girl: Share your Clemson gameday outfits! Share your Clemson gameday outfits! We want to see your Clemson gameday outfits from this weekend's game! 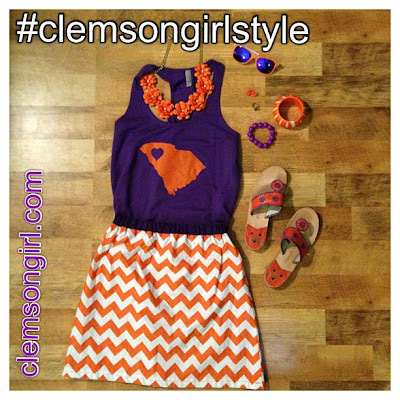 Share your photo on Instagram and tag us (@clemsongirlblog) and use hashtag #clemsongirlstyle. You can also share your gameday outfit photos with us via email (clemsongirlblog@gmail.com) or message us on our Facebook page. We will share our favorite gameday looks on the blog next week (and give you credit of course!). One lucky Clemson Girl will win a Clemson Girl prize pack for the best gameday outfit! Skirt is homemade and other jewelry purchased years ago. We can't wait to see all of your gorgeous Clemson gameday outfits! Go Tigers!